Continental breakfast an outdoor pool and free Wi-Fi await our guests at the non-smoking Brick House Hotel located minutes from popular Branson attractions.All 50 rooms on two stories at the non-smoking Brick House Hotel include flat-panel cable TVs coffeemakers and free Wi-Fi. Guests can fuel up for the day at the hotel's continental breakfast buffet. There are conference rooms for meetings and a seasonal outdoor pool as well as vending machines and a 24-hour front desk. Pets are allowed for a fee and parking is free. 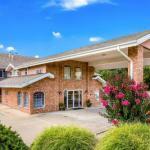 The Brick House Hotel is located off Shepherd of the Hills Expressway three-and-a-half miles west of downtown Branson. Many of the city's points of interest are within a three-mile radius including the Branson Theatre District Tangler Factory Outlet the Titanic Museum and White Water Park. Silver Dollar City and Marvel Cave Park are seven miles west. Branson Airport is 13 miles away and Tulsa International Airport is 190 miles southwest.